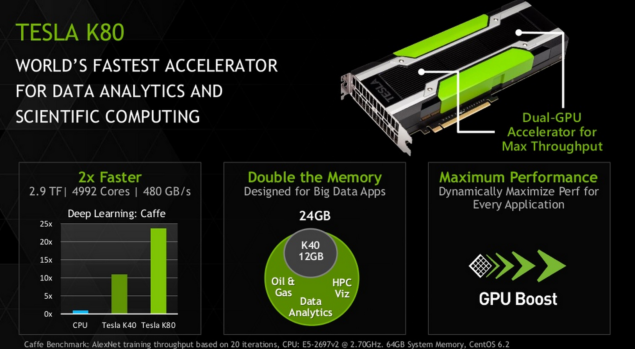 In a conference regarding supercomputers, NVIDIA introduced their high-performance Tesla K80 accelerator featuring two Kepler GK210 GPU cores. 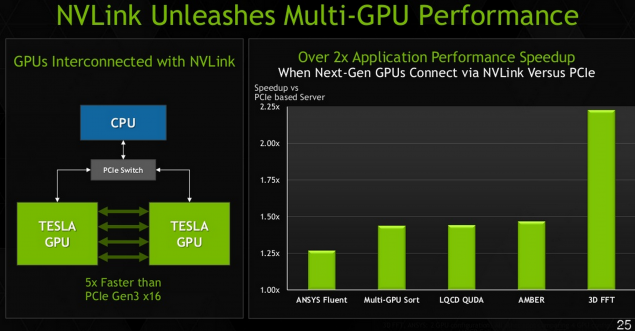 We last saw Tesla K80 (Previously codenamed Atlas) three months ago where it was denoted by the GK210-DUO name and today, we can finally confirm the specifications of NVIDIA’s latest Telsa accelerator with a double precision compute performance of 2.9 TFlops. Since the Tesla K80 is a dual-chip graphics card, it will feature two GK210 chips which are codenamed as the “GK210-DUO”. 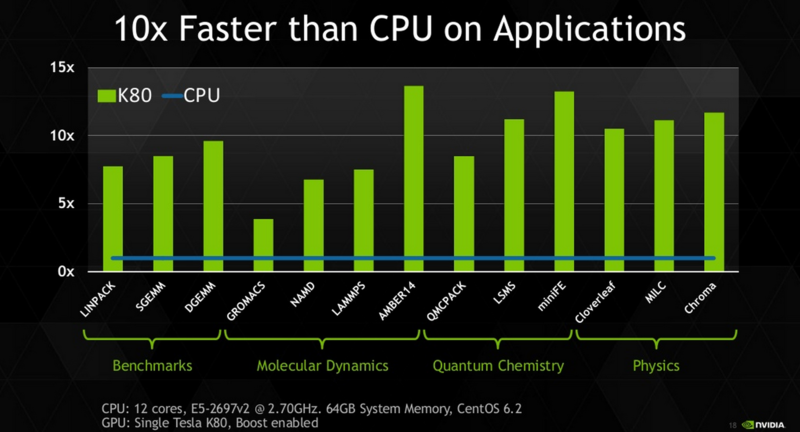 The specifications will include two GK210 chips featuring 4992 CUDA cores (2496 CUDA Cores each), 416 TMUs and 96 ROPs. The card features a massive 24 GB GDDR5 VRAM featured along a 384-bit bus interface, clocked at 5.00 Gbps. It pumps out 480 GB/s bandwidth and features a maximum TDP of 300W that is 75W lower than the GeForce GTX Titan Z. The core clock is maintained around 573 MHz and the card also features a boost clock of 875 MHz. 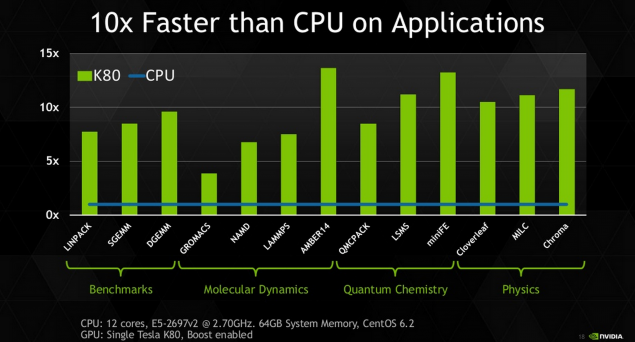 The memory is clocked at 5 GHz for each GPU. For cooling, the card can adopt a passive heatsink design if the thermals are under control. The large heatsink shroud comes in green and black color with a silver lining which gives a pleasant view, although the card would never be seen when packed inside a dense server. Large exhaust vents push the hot air out of the case which is supplied from the cooling in the server environment. 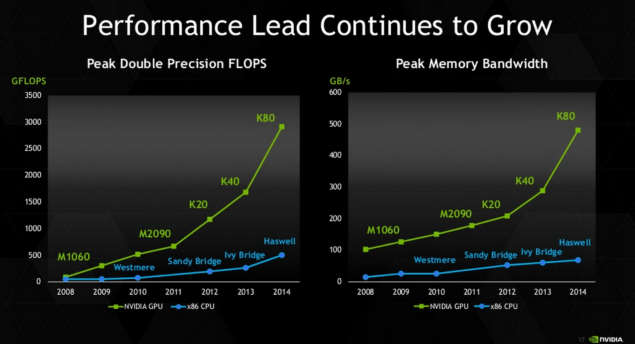 A slide posted in NVIDIA’s HPC oriented Heterogeneous Computing Solutions presentation shows off the Tesla K80 “GK210-DUO” graphics card in a performance slide which provides a peak bandwidth of 480 GB/s and total double precision performance rated at 2.9 TFlops. 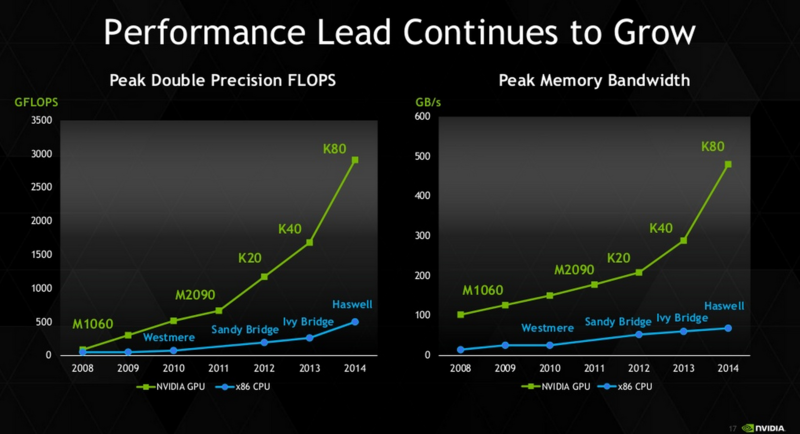 The single precision performance for the card is rated at over 8 TFlops which is impressive from a HPC perspective. 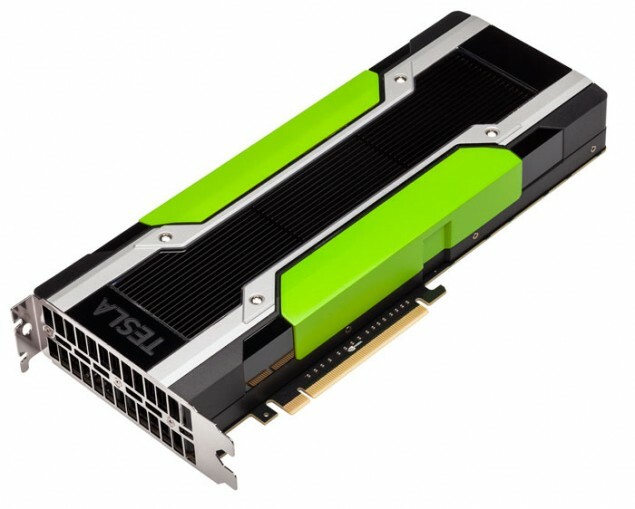 The card will retail for a high price of around $7000 US or even more but for users who want to stick something close to the Tesla K80 can just grab the GeForce GTX Titan Z for $3000 US. Even the GeForce GTX Titan Z is getting major price cuts through system builders with a few OEM builders offering a $1000 US price cut on the card dropping it down to $2000 US which still is a huge price for a graphics card but a lot cheaper than its original MSRP. While AMD has only W9100 in the competition which features 2.62 TFlops of double precision compute which is close to NVIDIA’s dual card offering, they do have plans to offer a dual chip FirePro variant in the near future which can easily overtake their green team rival.